Need to expand your game storage on your Nintendo Switch console? We wouldn’t be surprised – with only 32GB of internal storage, there’s a limited number of digital games you can fit on the console without sourcing an additional micro SD card for your Switch, or (heaven forbid) having to delete some of your downloaded games. Compare that to the 500GB or 1TB storage on the Xbox One, and it’s clear that the Nintendo Switch doesn’t have the same kind of carrying capacity for games as some of the other consoles out there. After all, while the Switch is technically Nintendo’s home console successor to the Wii U, it’s also a portable one – and it’s not extremely practical to lug around a hard drive with hundreds of gigabytes of data. 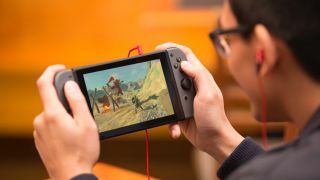 Thankfully, the Switch does come with a micro SD card slot – hidden under its kickstand, at the back of the console – meaning you can expand your game library well beyond its 32GB internal storage. We have separate guides for Nintendo Switch accessories or Nintendo Switch travel cases, but if you're after the best Nintendo Switch SD cards – or aren't sure if you need one – take a look below. Do I need a micro SD card for Nintendo Switch? If you’re planning on playing more than a handful of indie titles, yes. Zelda: Breath of the Wild alone will take up 13.4 GB, which is around 40% of the console’s on-board storage. It can be sensible to buy the larger AAA games on physical cartridges, to avoid the likes of Mario and Zelda taking up all the space. But for sheer convenience, nothing beats having all your titles compressed into one handy memory card. Are save files kept on memory cards too? No, it’s just your games that can be saved onto external memory cards. Save files are all kept on internal storage – partially to prevent piracy – though thankfully they don’t take up too much room by themselves. If you have a subscription to Nintendo Switch Online, you’ll also be able to back up your save files to the cloud. If you manage to break your console – you monster – you can then restore your progress safely. You’re able to re-download any purchased game software for free too. What micro SD cards will work on Nintendo Switch? According to Nintendo’s own guidelines, you can use a micro SD card (below 4GB), micro SDHC (4-32GB), or micro SDXC (eXtended Capacity, above 32GB). And for a meaningful expansion on internal storage, you probably want at least another 16-32GB, and possibly more. Nintendo recommends a high-speed memory card for optimum performance, so you want to look out for a card with UHS-I support, and a minimum ‘read speed’ of 60-95mb/s. If you’re using a micro SDXC memory card (above 32GB), Nintendo says “you must first connect the console to the internet and perform a system update” before downloading games onto the card. Nothing like the Nintendo stamp of approval to put you at ease. Sandisk is a massive memory card manufacturer – though usually with regards to cameras – and these tie-in options have a read speed of up to 100mb for fast loading. A minimum 30-year warranty, too. They even come with a friendly mushroom (for the 128GB model) or Triforce design (for the 64GB model). You won't see the design much when it's in the console, but you'll know it's there. Not quite as official, but still very much a reputable brand – and Kingston's 128GB memory card comes in at a few pennies less per gigabyte than its Sandisk counterpart. You're getting a slightly slower load-time, with only 80mb/s, but that's still well within Nintendo's SD card guidelines – and the option for 16GB, 32GB, 64GB, 128GB, or 256GB models. 400GB? We can't imagine you'll fill that amount in a hurry, but it's reassuring to know you won't run out of space. You can technically get 512GB now, but you see a large uptick in price just for that small increase in storage – so we recommend sticking to 400GB for now. Not what you're looking for? Check out some of the outright cheapest Nintendo Switch bundles, deals and accessories.